Verizon locked in another deal with the NFL this season to bring you exclusive content through their NFL Mobile app. This time around though, they are giving 4G LTE customers free premium access for the entire season, something 3G customers have to pay $10 a month for. Premium access includes live streaming of Sunday Night Football games, Monday Night Football games, and even NFL Network exclusive Thursday night games. NFL Redzone which gives you quick looks at any game with a scoring opportunity is a part of the Premium package as well. And yes, that is a picture of the DROID Bionic. No, they have not announced it yet. More info here. Press release below. BASKING RIDGE, N.J. – The NFL and Verizon are bringing fans back to football no matter where they are with more live games, live NFL Network, news and information with NFL Mobile only from Verizon, powered by the nation’s fastest, most advanced 4G network and largest, most reliable 3G network. New this year, NFL Mobile will offer live streaming of ESPN’s Monday Night Football (MNF) package starting on Monday, Sept. 12 with the kickoff double header featuring the New England Patriots visiting the Miami Dolphins followed by the Oakland Raiders visiting the Denver Broncos. The 17 MNF games are in addition to the live stream of NBC’s 18-game Sunday Night Football package, NFL Network’s eight-game Thursday Night Football slate and NFL RedZone, which delivers every touchdown from every game on Sunday afternoons. NFL Mobile delivers coverage of every NFL regular season game, and fans can also use NFL Mobile to keep up with the action by watching NFL Network 24/7 throughout the entire season. · A redesigned scores page with enhanced content to keep you on top of all the action pre, post and during the game. Verizon Wireless 4G LTE smartphone customers have access to NFL Mobile premium, including all video, for the entire season. 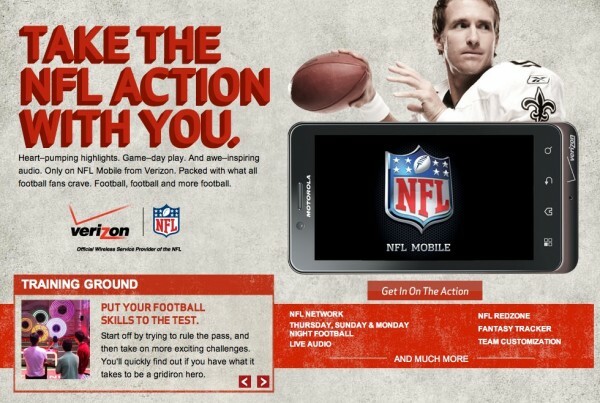 Customers with 3G smartphones who want even more NFL video can subscribe to Verizon Video for $10/month. · NFL RedZone with live look-ins featuring every touchdown from every game on Sunday afternoons. NFL Mobile is available on many smartphones from Verizon Wireless, including DROID 3 and DROID PRO by Motorola. All Verizon Wireless smartphones require a data package. Data usage applies to the download and use of NFL Mobile. Verizon Wireless is the official wireless service sponsor of the NFL. To download NFL Mobile, visit the Verizon channel in Android™ Market or call “**NFL”. For more information about NFL Mobile and a list of compatible phones, visit www.verizonwireless.com/nfl.